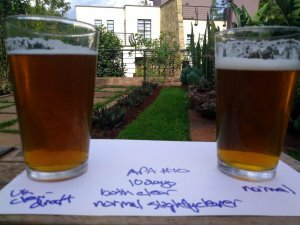 [January 2019] Probably my main goto hop is Cascade. Cheap, reliable and available. However, I use 3 kinds of Cascade: Cascade I bring from the US, ‘US Cascade’ that I buy locally and ‘Hallertauer Cascade’, which I believe is the Cascade hop, but grown in Germany. The latter is similar in price to Cascade in the US but available locally, so I was interested to know if it is as good as US Cascade. 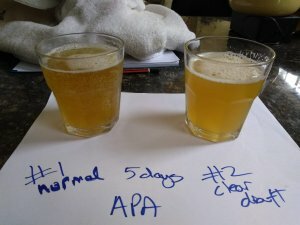 I brewed two APAs identically, but used Hallertauer Cascade in one and Cascade I had brought from the US in the other. I expected to be able to tell the difference, but I was only correct on a triangle test 1 of 5 times. Visitors were only correct 5 out of 9 times. That’s not bad, however, of the 5 people who were correct 3 out of 5 preferred the Hallertauer Cascade anyways. Conclusion: I’ll buy the Hallertauer Cascade in the future. [December 2018] . 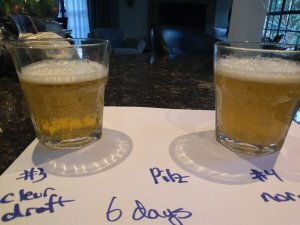 Over the last few months I have brewed 4 double batches of beer, putting one batch in a keg with a clear draft device that pulls the beer from the top of the keg instead of the bottom. This is meant to allow clearer beer faster. However, for 3 of the 4 double batches, I had the opposite experience. 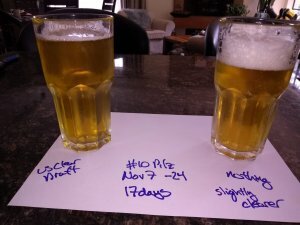 So, while it may indeed help, my current observation is that there are enough variables in my own process that any benefit of the clear draft system is not observable in my beer. I’ll probably try this a couple more times in the future, in which case I’ll update this.